There are few things as archetypically Oklahoman as small-town tornado damage, and this, from Pickett, Oklahoma, was part of a very memorable day in my life as a photojournalist. 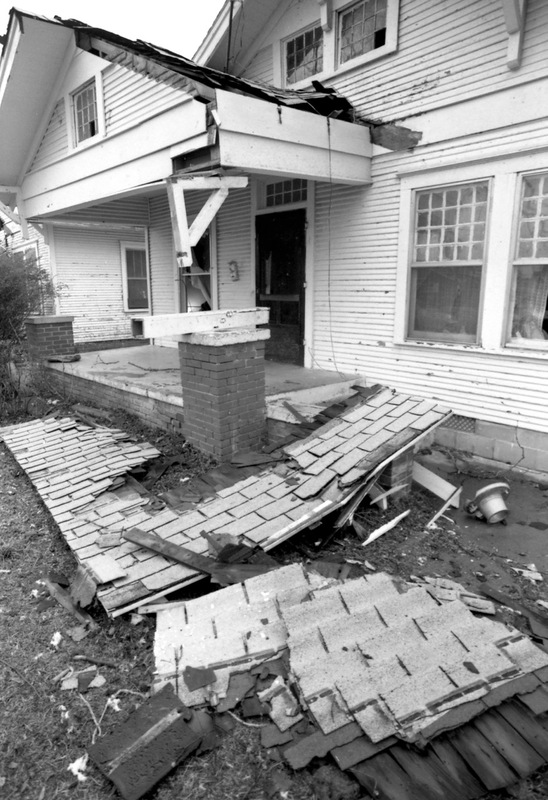 This house at 14th and Broadway was just one of the structures damaged in the March 21, 1991 tornado in Ada. All journalists have days that stand out in their memories. Earthquakes. Tsunamis. Terrorism. War. 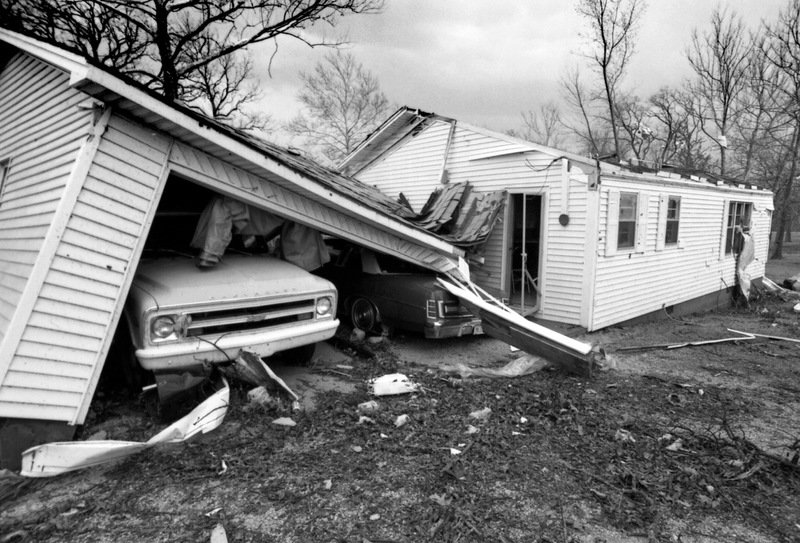 For me here in Ada, Oklahoma, some of those memories are from tornadoes, and one tornado stands out: the storm that became known the “Greater Ader Tornader,” 25 years ago today. It was preceded, ominously, by famed weatherman Gary England canceling his Ada presentation of Those Terrible Twisters so he could monitor the weather situation from his channel 9 base in Oklahoma City. As part of working a split shift for morning deadline and afternoon baseball, I went home for a nap at around 2 pm. Just before 4:30, Jeff, our current sports editor who was a general assignment reporter then, called and excitedly told me there was a tornado warning and there was a tornado reportedly “on the ground” in Pickett just to our west. When Jeff told me about the report of a tornado in Pickett, I grabbed my camera and my 180mm lens and stepped out onto my balcony to photograph this wall cloud over northwest Ada. This is the flying debris Randy and I witnessed from two different locations, just as it flew past my back door. I ducked back into my apartment and paused for a second in my hall: I was on the second story of a flimsily-built apartment and, in my estimation, could do little about my situation. Fortunately, the funnel cloud passed just half a block to my south, and not actually touching the ground at that point. As soon as it had passed, I locked my doors and ran to my car, immediately driving down the street to 12th and Mississippi, where the scanner was immediately reporting damage. 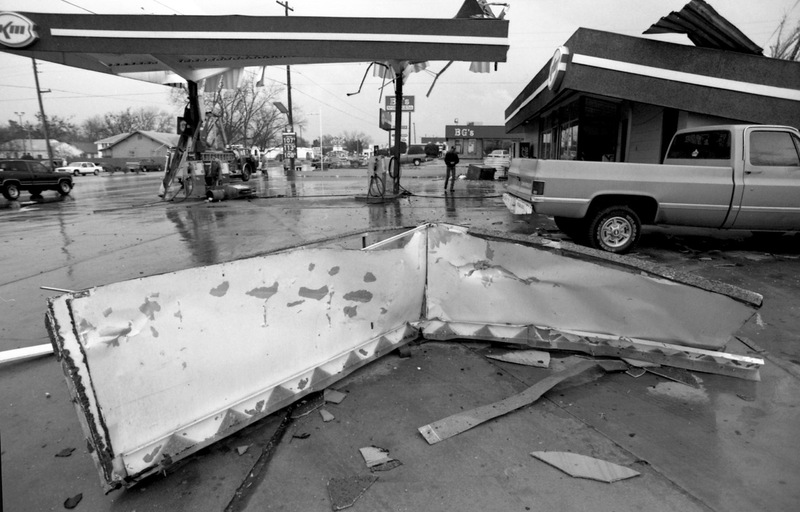 I discovered the filling station at the end of my block had been significantly damaged. 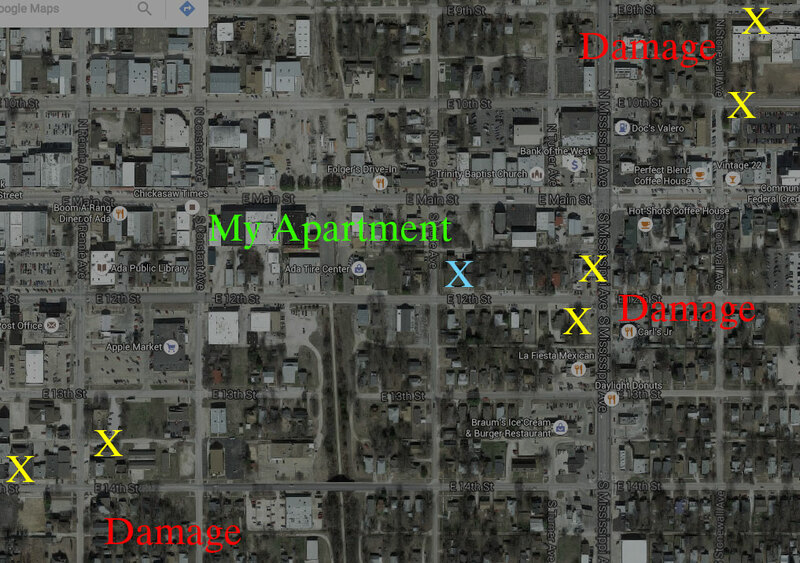 This is a rough map of the damage near where I lived. 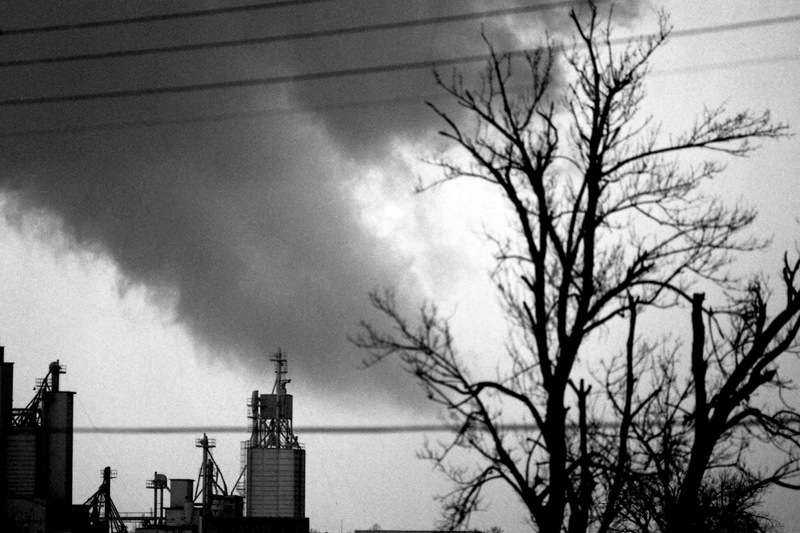 The tornado moved from southwest to northeast. As you can see, a combination of lifting and turning spared my home. This is the filling station at the end of my block. 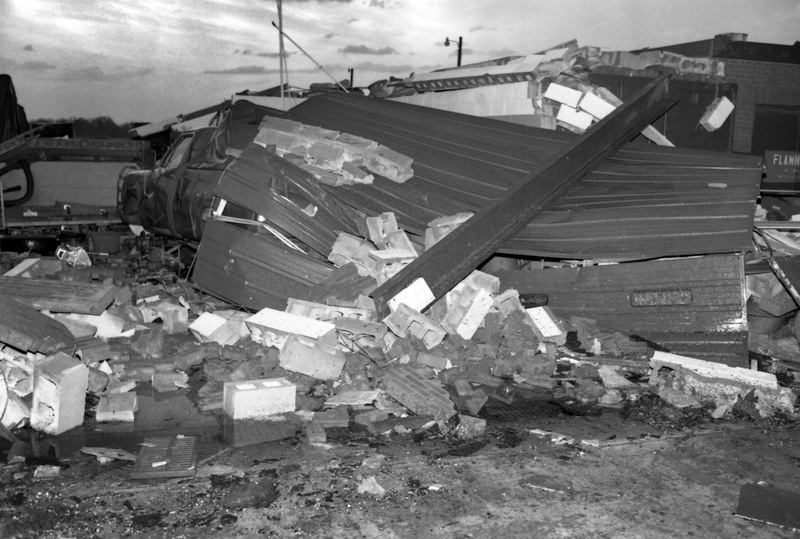 After the tornado made this damaged, it continued to the college. This is the facade of ECU’s New Science Building, which had just been completed and had yet to be occupied when it was damaged. I then darted over the East Central University, which was just five blocks from my house. 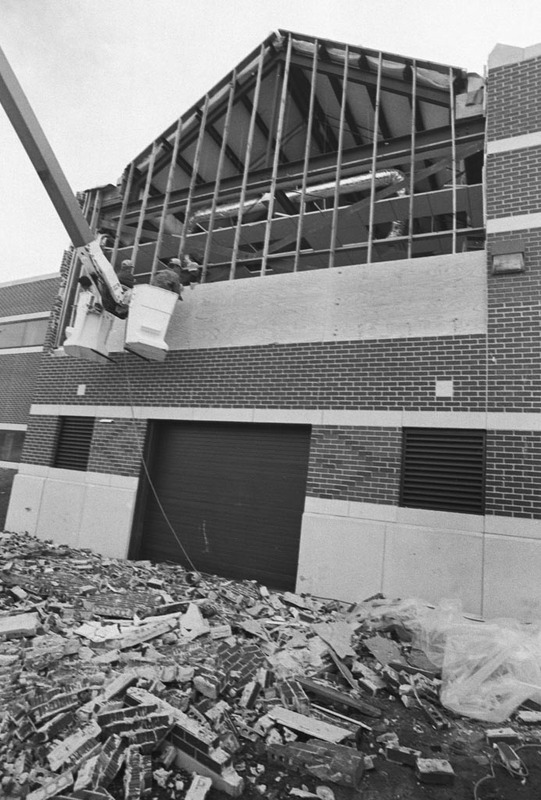 A van was overturned in the parking lot, and the New Science Building, which had yet to open, was damaged as well. Continuing to follow scanner reports (since it would be six more years before I got my first cell phone), I made my way west on 14th Street to the 100 block, where several houses had been pushed off their foundations. Continuing to listen to scanner reports and word on the street, I drove out to Pickett, where several houses were down. Finally, as darkness approached, I swung by the National Guard Armory and made my last pictures of the day. 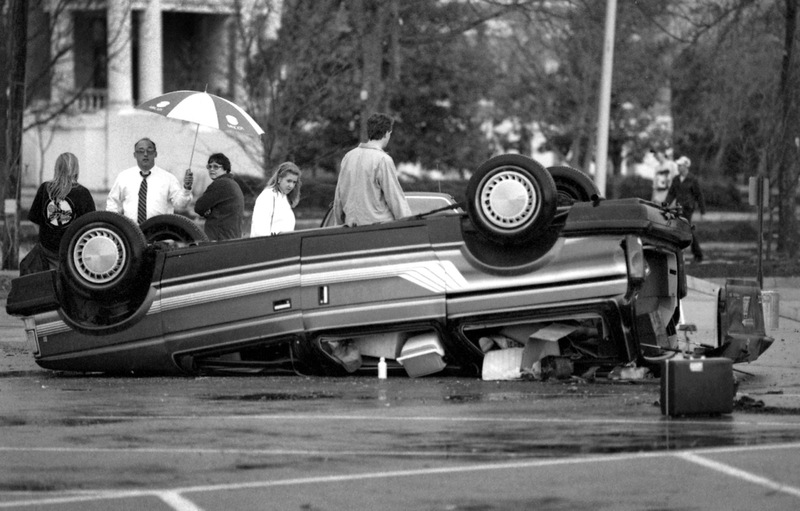 This car was unoccupied when it was flipped over by the tornado that damaged ECU’s new Science Building. These were the first tornados of the season in Oklahoma. There is a decent breakdown of Oklahoma tornadoes in 1991 here. By dark, Jeff and I had worked our ways back to each other at the National Guard Armory. Then we went back to the office to prepare our news product and move our stuff on the wire to all the papers in the state. It was an exhausting, exciting, amazing day in our lives as journalists. The new Center for Physical and Environmental Science at ECU had just been completed and the insurance was set to be switched from contractor to university in mere days. I mentioned both of those items in this piece. That sounds like a terrible day for Ada, but a great day for photojournalism. On that day, I was in Springfield, Mo., visiting the college I would eventually attend. 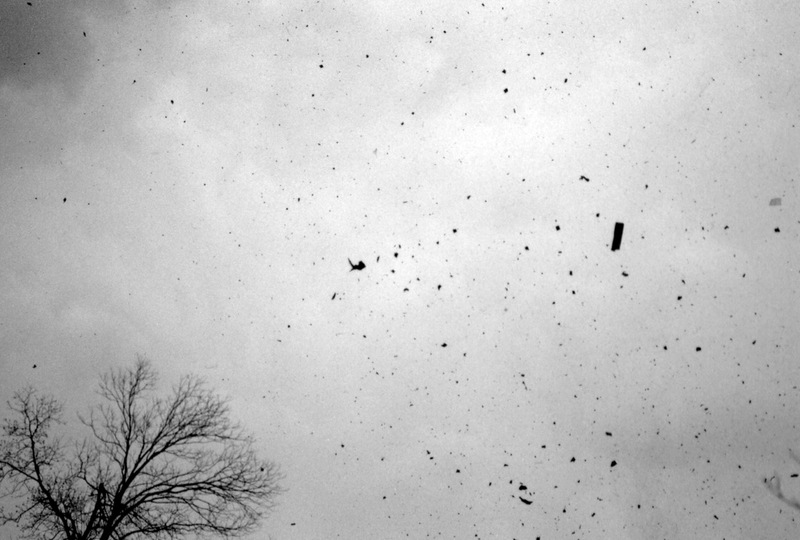 That is an amazing photo of the debris blowing in the wind. You hear about things like that but rarely see an actual picture. Exemplary work. God help me. I love me some bad weather.